Everyone has a story, so why not wear it around your neck at all times! Origami Owl, a custom jewelry company, allows women to create necklaces that will soon become your story. Bella, the founder of Origami Owl, refers to these necklaces as “Living Lockets”. Creating this company at age 14 was quite a captivating task for Bella. Her dream was to make enough money to buy a car for her sixteenth birthday; in return she created a company that has become a huge icon for mothers and daughters of all ages! You may be wondering, what are living lockets?! There are 5 simple steps you need to follow when creating your personal living locket! Step 1: Pick your favorite charm(s). They have over 350 charms you can choose from, ranging from animals, holidays, family, food, initials and so much more! 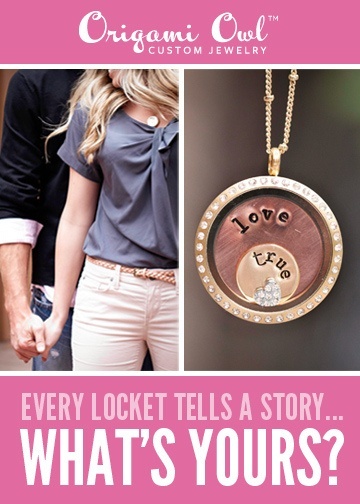 Step 2: Pick the locket of your choice! They are round so all of your charms can be seen clearly inside. Lockets come in silver, gold or rose gold. Step 3: Pick your chain. You can choose from a simple chain or a more complex custom chain! Step 4: Pick your plate.This is an optional step. You can choose to either have a background or leave your locket clear. The background plates come in rose gold, silver, or gold. You then can choose from 17 different plates, which have various words on them. After that you can chose the size of your plate; small, medium or large. Step 5: This last step is also optional. You can chose from 44 different dangles to add to your necklace! If you are still unsure or would like more information about Origami Owl Living Lockets you can visit, http://tanya.origamiowl.com. Origami Owl also allows women to sell necklaces out of their own home too! You can become a “Designer” yourself and even host Origami Owl parties out of your home! Don’t forget Mother’s Day is right around the corner and this would be the perfect heartwarming gift to brighten her day!